All efforts are being made to bring glass and plastic recycling back to the county. There are several barriers in place when trying to recycle these materials, such as transportation costs, markets purchasing these materials, and recycling contamination. What’s recycling contamination? This is when recyclers throw materials into a recycling bin that either can not be recycled or have not been sorted into the correct bin. This causes contamination of the recycling material already in the bin and, depending on the level of contamination, can result in the entire bin being landfilled instead of recycled. Since glass and plastics aren’t currently being recycled, consider purchasing alternative containers and packaging materials that can be recycled. For example, purchase beverages that come in aluminum cans instead of glass bottles, so that the cans can be recycled. Also, asking local stores to carry items that come in recyclable packaging or are biodegradable can aid us in our local recycling efforts. If you have any questions on recycling in Beaverhead County please call the Solid Waste office or contact Beaverhead Recycling at (406) 683-1249 in the evenings. Like us on Facebook for continuous updates! Newspaper, office paper, magazines, phone books, all kinds of envelopes, catalogs, paperbacks, plotter paper, etc. & mixed and loose aluminum, steel, and tin cans. If you collect cans in bags, the Humane Society on Lagoon Lane accepts bagged, crushed cans. Otherwise, please put cans in the bins loose. Dillon Middle School, the intersection of Sacajawea Dr. & N Oregon St. SMOOTH CARDBOARD – In Dillon, smooth cardboard is considered contamination. i.e. beer & soda cartons, cereal or shoe boxes, packaging, etc. There is no buyer for smooth cardboard at this time. Please trash or compost it. FLATTENED, CORRUGATED CARDBOARD ONLY – Thicker cardboard with two flat outside pieces and a middle-rippled piece. Laptops, personal computers, cell phones, rechargeable batteries, digital cable & cable boxes, internal components (hard drives, DVD & CD drives, power supplies), servers, circuit boards, scrap memory, all types of electrical cords, network equipment, cables, scanners, printers, keyboards, mice, microwaves, etc. Landfill, marked bin, 3801 Ten Mile Rd. CELL PHONES ONLY: Women’s Resource/Community Support Center, 221 ½ S Idaho St. PLASTIC BAGS: Safeway only in Dillon. Target, Rosauers, Albertson’s, and Walmart stores recycle plastic bags in other cities. CDs/DVDs/Floppy Disks: Visit CDrecyclingcenter.com for information on how to recycle your old CDs, DVDs, and cases. 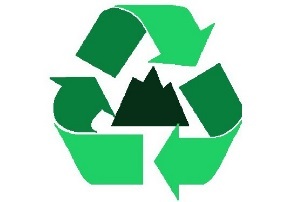 Visit GreenDisk.com for information on how to recycle floppy disks, pagers, CDs, DVDs, and any small ‘technotrash’. Visit FloppyDisk.com for information how to recycle only floppy disks. FLUORESCENT LIGHT BULBS: R & R Electric in Butte, 631 Utah Ave, all size tubes for a small fee. Home Depot and Lowes recycle the curly CFLs.